The Embroidered Minds Epilepsy Garden will be one of the Artisan Gardens at the RHS Chelsea Flower Show in May 2018 as part of the continuing Embroidered Minds collaboration. Initially instigated by author Leslie Forbes and garden designer Kati Crome (Chelsea Gold & Silver Gilt medal winner) in 2016 the garden design has the Embroidered Minds theme at its core. Aiming to raise awareness of epilepsy and the challenges that both sufferers and their families still face today. A vertical living wall referencing William Morris designed surface patterns, oak bench, tiled path and foreground planting are interrupted by a seizure represented through planting followed by a possible heightening of the senses with more vivid planting post seizure. Within the garden will be a specially commissioned bench by furniture designer Toby Winteringham handmade from steam bent oak secured with copper rivets and supported by corten steel legs. The bench represents an EEG readout, which starts as a calm resting place and is then disrupted with the chaos of a seizure. Running below the bench is a ceramic tiled path designed by artist Sue Ridge and designer/ceramist Andrew Thomas. Starting with designs inspired by William and May Morris, the tiles are laid in a disintegrating pattern. The surface designs transform into neurological and seizure based images and ‘glitches’ as the tiles run under the chaotic end of the bench. 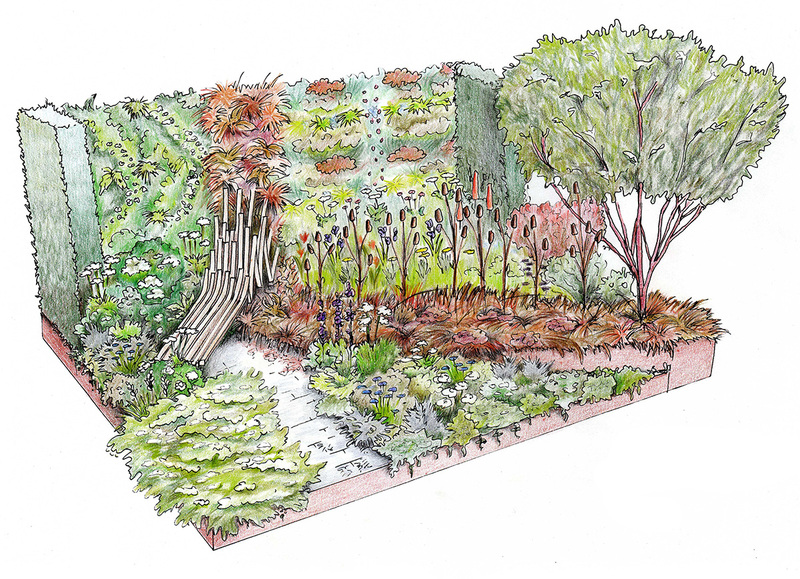 Included in the garden scheme are various plants used in William Morris surface patterns and others used to treat epilepsy in Victorian times. The garden is partly sponsored by Epilepsy Society and Young Epilepsy, with some of the young people resident with Young Epilepsy at their site in Surrey helping to grow a selection of the plants for the garden.